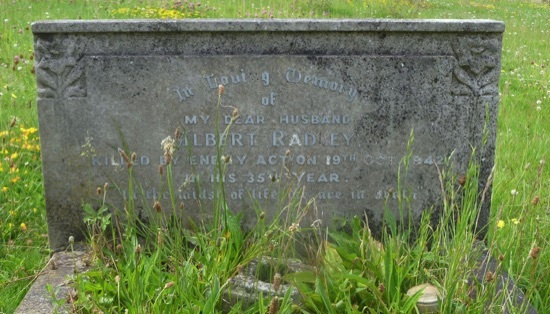 Albert Radley, was born and bred in Chelmsford and, like his father, worked at the town's Hoffmann's bearings factory, stariting there around 1921. He married in 1931 and had two children and lived in Browning's Avenue on the town's Boarded Barns Housing Estate. He joined the St. John's Ambulance Brigade in 1929. He was killed in an air raid on Hoffmann's in October 1942. Saints' Church, Boarded Barns, preceded the interment at the Writtle Road Cemetery. The Rev. AsMey Turner (vicar) officiated, and Miss Brown was at the organ for the hymn, " Praise, my soul." The mourners were: The widow; Mr. Alf. Radley, father; Mr. Herbt. Radley. brother; Mr. and Mrs. C. Bailey. Mr. and Mrs. H. Crow, Mr. and Mrs. D. Thomason, Mrs. W. Clift, Miss E. Radley. Mr. and Mrs. H. Gowers, Mr. and Mrs. E. Smith, Mr. and Mrs. J. Rogers and Mrs. Harding, brothers-in-law and sisters; Miss Smith, Mrs. H. W. Smith, and Miss Cronk, aunts; Mr. and Mrs. T. Sayer, Mrs. E. Sayer, Mrs. Thomason, C.Q.M.S. C. Cordell, Pte. J. Russell. The Hoffmann Co. was represented by .Messrs. 'C. Pryke (joint managing director). W. J. Stone (works manager), E. G. Brown (late works manager), L. F. Cubitt (chief planning engineer), and A. S. Emery (departmental manager). Mr. R. Armitage (chairman of directors) and Mr. E. S. Spyer (vice-chairman) were unable to be present owing to indisposition. Chelmsford Division St. John Ambulance Brigade were under Div. Supt. E. Barber, and the Writlle Division under Amb. Officer Sills, the Crompton Parkinson Division under Amb. Officer Reece Vowles. Dr. J. T. Whitley (Acting-County Commissioner), County Officer W. E. Norfolk, and Corps Officer J. S. Smith represented the County Staff; Major H. S. Doe, M.C., represented Brig.-Gen. T. Wigan, C.B., C.M.G., D.S..O., J.P., President of the Chelmsford Division. Wardens of New Street, Corporation Road and North Avenue were represented by Messrs. C. Frost, J. Conerly. C. Butcher, L. Gifford, A. Orrin, C. Kcnnell, F. W. Powley. The many floral tributes included those from the Hoffmann Directors; Works Management staff; Mr, Hart and friends. Cage Assembly Dept. ; Messenger Boy Tony; Neighbours and friends, Browning's Avenue; Postmaster and Staff at the Post-office (where the widow is engaged); Hoffmann First-Aid Party; Chelmsford Division St. John Ambulance • Westfield Ambulance Depot; Wardens of North Avenue; and Crompton Ambulance pivision. —The funeral was furnished by Messrs. A. J. Andrews and Son, 20 Duke Street. Albert left an estate valued at £390 4s. 11d. At the time of his death Albert's father was resident at 7 Steamer Terrace in Chelmsford. Albert's widow died on 8th August 1988, aged 83. Albert was born in Chelmsford on 8th July 1908, the son of Albert Edward Radley (1877-1957) and Sarah Ann Radley (nee Wood) (1881-1941). His parents had married in Chelmsford in 1898. Albert's siblings, all Chelmsford-born, included Alfred Edward Radley (born 1900), Alice Beatrice Radley (born 1901), Lilian May Radley (born 1902), Joy Radley (born 1905), Gladys Amy Radley (born 1906), Doris Maud Radley (born 1910), Annie H. Radley (born 1911) and Edith Ivy Radley (born 1915). In 1911 the census recorded 2 year-old Albert living with his parents and six siblings at 12 Glebe Road in Chelmsford. At the time his father was a labourer at Hoffmann's ball-bearings factory in Chelmsford. Albert subsequently also worked at Hoffmann's, starting his career there around 1921. In 1931 Albert married Ivy Irene Smith. She had been born in Stansted on 11th June 1905. The couple had two Chelmsford-born children, a boy born in 1932 and a girl born in 1934. "Albert Radley, Brownings Avenue, Chelmsford, summoned for riding a bicycle without front light on June 13, pleaded not guilty.—P.c. Oliver 6aid saw the defendant riding a bicycle in Broomfield Road at 10.55 p.m. without a front light. When stopped defendant said, "My dynamo slips. I have only ridden a few yards. "—Defendant: This case should never have been brought. When I noticed that my light was out got off and tinkered about with it. It came on, and the constable came up. He asked me if I had been riding without light. It was due to my honesty that I said "Yes. "—Case dismissed payment of 4/- costs." In 1938, through the St. John's Ambulance, Albert gained his Grade Two Instructor's Certificate in Air Raid Precautions at Chelmsford. By 1942 Albert was living with his wife and children at 72 Brownings Avenue, Chelmsford and he was working as clerk at Hoffmann's. Hoffmann’s was a target for the German air force throughout the war. At 10.59 a.m. on 19th October 1942 a lone German Dornier Do 217E aircraft approached Chelmsford from the east at an altitude of around a thousand feet. Taking advantage of low cloud and poor visibility, typical of a misty autumn morning, the aircraft dropped to around a 150 feet to make a bombing run on Hoffmann’s approximately along the line of one of the factory’s railway sidings. Almost immediately Hoffmann’s light machine defences opened up on the raider, but other army posts were unable to fire their Bofors guns at the aircraft because of its extremely low altitude - the gunners would have been firing in the direction of nearby buildings and people. The Dornier was able to release two 500 Kg SC high explosive bombs on the works, with delayed actions of about twenty seconds, and machine gun the ground. With its bombs released the aircraft turned north-eastwards, circled to the north of Chelmsford and made off due east towards the coast, apparently unscathed. Those on the ground were not so fortunate. One of the bombs scored a direct hit on the factory. It penetrated the roof and exploded in the recently completed Cage & Assembly Shop, (part of Hoffmann’s ‘C factory’, to the north of Rectory Lane). 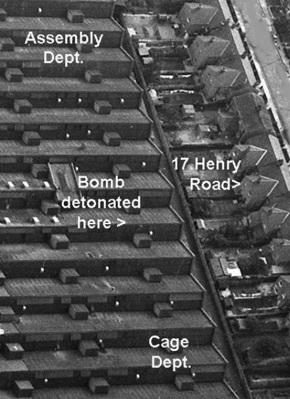 The other bomb deflected off the factory’s roof and exploded amongst houses in neighbouring Henry Road. Four people died as a result of the bomb at Hoffmann’s, including 34 year-old Albert. 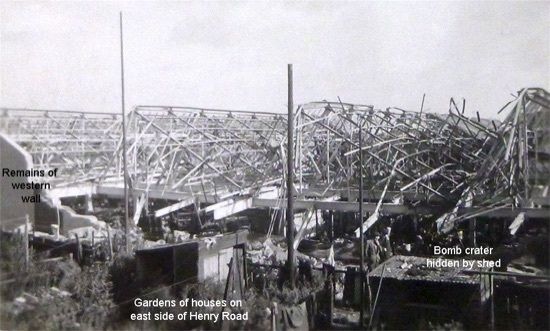 Another five people were killed at Henry Road which lay at the western edge of the factory site. As well as the four fatalities the Hoffmann’s bomb resulted in six seriously injured, and 43 men and 16 women slightly hurt. Casualties would have been far higher but for the excellent civil defence arrangements at the factory which meant that many of the factory workers were inside air raid shelters when the bomb struck. Albert was a civil defence worker and was one of the longest serving members of the Chelmsford branch of the St. John’s Ambulance Brigade. He was the leader at their Westfield Depot and a first aid party leader at Hoffmann’s. "AMBULANCE MAN'S DEATH. The funeral took place on Saturday of Mr. Albert Radley, of 72. Browning's Avenue, whose death occurred through enemy action. The deceased, who was in his 35th year, had for over 20 years been in the employ of the Progress Dept. of Hoffmann Company, and was one of the oldest members of the St. John Ambulance Brigade, Chelmsford Division, which he joined in 1929. He had given loyal and efficient service, and was leader of the Westfield Depot. The esteem in which.he was held was shown by the large gathering at the church and the Cemetery of the various branches of Civil Defence organisations.